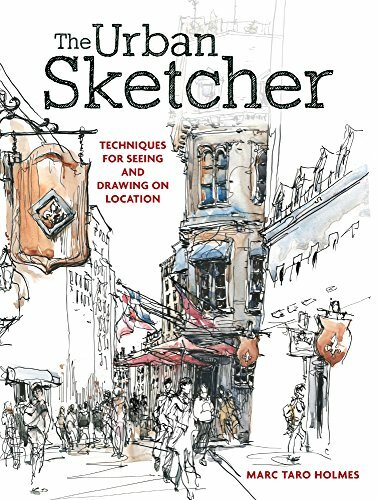 The Urban Sketcher is a helpful book for the outdoor sketcher authored by Marc Taro Holmes who's a concept artist, avid sketcher and blogger. I actually met him in Barcelona during the Urban Sketching Symposium 2013. Didn't know that he had a book coming out until very recently. The book's designed like a workshop. The writing is casual and enthusiastic. There are 15 step-by-step demonstrations with complete explanations, and also hands-on exercises and instructions for you to follow along. There are only three chapters to the book. The first chapter covers the basics of drawing on location. This section is more useful to beginners because it reinforces the basics of drawing, and in this case observation drawing, talking about sighting techniques, proportions, understanding shadow shapes, composition and planning a sketch. The second chapter builds on what's taught and goes into using pen and ink. The emphasis of this chapter is to create visual interest and focus points using various contrast techniques. There are also lessons on how you can sketch human figures, capture what's happening on location with your sketches. Throughout the book, Holmes uses a three-pass sketching process. Basically, it's a process that gets you to do a rough contour drawing to get the shape and outline, followed by inking or watercolour, and then adding in the values and contrast to create visual interest. The instructions are very clear and easy to follow. The last chapter talks about various fun watercolour techniques that you can try out. It's an engaging book. There are lots of useful tips and techniques provided, many come from his years of experience from sketching outdoors. If you've always felt intimidated by drawing on location, aka urban sketching, you'll find this to be an encouraging and useful guide. There are some typos but minor. Overall, it's a good book for those who like hands-on, tutorial style books. I recommend it to beginners and intermediate sketchers. Check out his blog for more art and writeup. If you want to explore more urban sketching books, I would also recommend Urban Sketching: The Complete Guide to Techniques, Sketch Your World, Sketching on Location, Freehand Drawing and Discovery and The Art of Urban Sketching. Yup, there have been a lot of books on urban sketching released in the recent years.